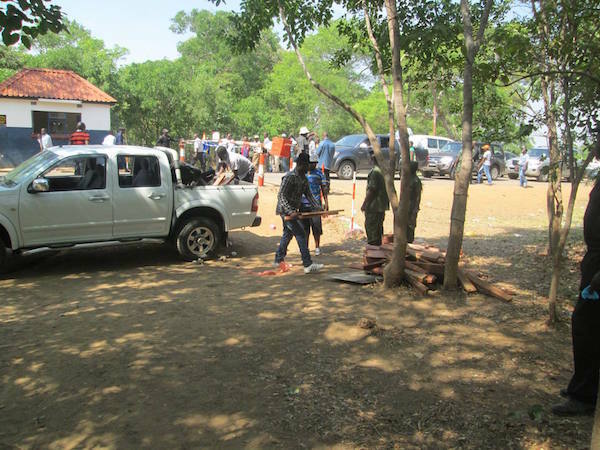 Alert Police on Saturday morning intercepted a white unregistered van with several planks which Edgar Lungu’s thugs wanted to use to beat opponents at the failed PF general conference in Kabwe. The van which is believed to be an official government vehicle for one of the district commissioners was intercepted at the main gate to the institution with several planks measuring about 1 mtere. Police ordered that the planks be offloaded and later allowed the vehicle to proceed. Meanwhile Mandevu parliamentarian Jean Kapata threatened to strangle any person opposed to Edgar Lungu. “Nganaumfwa uulelanda against Edgar Lungu ndemukama pamukoshi (If anyone speaks against Edgar Lungu, I will strangle them by the neck)” warned Kapata. And acting President Guy Scott risks being embarrassed if he attends the conference tomorrow. Scott whom Lungu’s thugs are now calling Welensky in reference to former Northern Rhodesia governor Sir Roy Welensky has been accused of wrecking the PF. After the conference failed to open, several PF leaders took turns to racially abuse Dr. Scott through songs and speeches. Chiefs and traditional affairs minister Nkandu Luo accused Scott of being on a mission to kill PF and later go back to Scotland. The conference has been postponed to tomorrow to allow for fresh accreditation which is taking place tonight at the venue but the verification exercise is in futility because it is being done by the same people who doctored it. The PF central committee which wants Lungu endorsed as president has appointed a committee to serve as an elections body.